David Van Voris is an award winning Division 2 kicker from Adams State University. 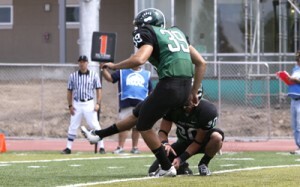 Photo Credit: ASUGrizzlies.com. When warranted, the agent-principal relationship can be of extreme importance. The principal puts his trust in the agent and authorizes the agent to act on his behalf. That agent has the fiduciary duty to put the principal’s interests above his own and always act in a way that the agent truly believes will serve as a benefit to the principal, whether or not the agent has anything to gain monetarily or otherwise. At a minimum, the person holding himself out as an agent capable of performing certain duties and obligations is required to be honest to his client. There are exceptions to the rule, but the fiduciary duty stated above is the general course of acceptable business for an agent. In the context of sports, the athlete is the principal and his contract advisor is the athlete’s agent (or one of multiple agents). Where agents tend to get a bad reputation (for themselves, individually, and for the industry as a whole) is when they stray from doing what is best for the players they are recruiting and/or representing and act simply out of self interest. Even worse is when an agent flat-out lies to a current or potential client. A recent article by Damond Talbot of NFL Draft Zone should serve as a cautionary tale. The article has a bold title – ““THE FAKE AGENT THAT SCAMMED ME” – The true story of David Van Voris.” Talbot had been keeping a close eye on Van Voris, a kicker at Adams State University, and providing him publicity that he had trouble finding elsewhere. All of a sudden, Talbot received an email from the kicker that left him concerned. It revealed that Van Voris signed with a “so called agent” and was “scammed.” Talbot copied and pasted the email into the article, and excerpts are provided below. When I first spoke to the manager (Sam) of my new agent (Brad), I was excited, he seemed like a really nice guy that was going to bust his *** to get me somewhere. Right away he told me he was in contact with a couple of teams, and I continued to practice and pray vigorously for some good news. All of my contact with the agency was through Sam, and not the actual agent Brad (something I didn’t think much of until later). On Friday May 17th I received the best phone call of my life from Sam. The next part makes me sick; he told me to put the phone on speaker phone and go into the room with my girlfriend, he proceeded to build up to the announcement that the Titans had cut the other kicker and were signing me with a bonus of $2,000 and that I could expect a phone call from them the following Tuesday. On Monday morning (the day before I was supposed to be signed to the Titans) I got a frantic phone call from Sam saying that he had been fired from the agency and that I was in a tough position to choose if I would go with him or stay with Brad…Sam told me he would call the Titans and see what to do then call me back. He never called back. On Tuesday, the day I was suppose to sign with the Titans and get details about how to proceed, the day rolled by slowly without word from the Titans or Sam. I decided to call Brad, and get his advice. He told me that Sam had been let go of after a blow out on Friday morning… Coincidence that it was Friday afternoon that I got my phone call? No. Brad informed me that Sam was looking at other agencies to work for and it was likely that he wanted me to follow him wherever he went. Later in the day I got several very off-putting texts from Sam telling me trust him and not to contact Brad anymore, and that he had gotten word from a Titans scout that he was supposedly friends with that Brad was contacting the Titans and telling them not to work with Sam or myself and that we were up to no good, which immediately sent off red flags in my mind. Sam proceeded to send me screenshots of texts from said Titans scout. He had spelled the name of the scout wrong, and anyone with an iPhone knows how easy it is to change the name of a contact (probably his girlfriend) and create a fabricated text conversation as a weak form of “proof”…I called Brad back and confirmed that he had not told the Titans not to deal with me, he had however sent out a professional e-mail explaining to the Titans that all further communication should be directed towards Brad or myself. Brad also gave me the real number for the Titans scout that Sam claimed to be friends with. I called and what do you know, this man had never heard of Sam or myself in his life. At this point I was completely dumbfounded. What did Sam have to gain by lying about any of this? Could it be possible that this was all a ploy to get me to his new agency? If that is the case then why all of these torturous games, why couldn’t he just communicate with me and let me know how badly he wanted to represent me. How anyone could make up that much of a boldface, cruel lie is beyond me. I had to let my family know that it was all a twisted lie, and for what? Well that remains to be the question at hand. All that I do know for certain is that you cannot put 100% trust in anyone in this industry. Only you have your absolute best interests at heart, so be careful. If you didn’t see it firsthand from the actual agent or the team, take it with a grain of salt. Never let your guard down, because clearly there are very sick people out there that can and will take advantage of you in a desperate time.